I received the nicest Christmas gift ever from a cousin in Louisiana. His name is Roland Theriot. 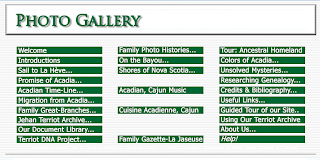 It is a video of a performance by the southwest Louisiana singing group, "Les Amies Louisianaises". singing 'La Grâce du Ciel' (Amazing Grace) Give the file a minute to download and set your video player to FULL SCREEN for best viewing. I told Roland that his timing could not have been better... for me anyways. It's a beautiful rendition of the song. Sit back at a quiet time and give it a listen. You will be glad you did... especially in this season. Just received the very sad news that we have lost a very dedicated and devoted founding member of the Terriot Acadian Family Society this morning. 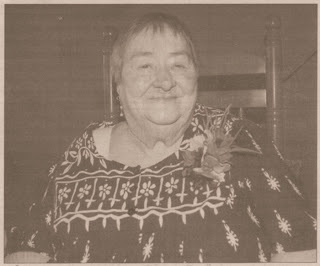 Aline Elizabeth Theriot Meaux died peacefully in her sleep this morning. She was with her loving family. Aline was born to Alexandre Telesphore Theriot II and Aline Marie Parks on 22 May 1922 in Mulvey Community in Vermillion parish, Louisiana. Aline was our delegate for the "Telesphore A. et Marie E. Fanguy Theriot" Great-Branch. Her Associate delegate has been her daughter, Louise Meaux Duhon. Please join me in extending to Louise and her family our most sincere condolences. To us, she was our connection with our Louisiana family. She worked long and hard starting in 1999 to pull our organization together. We came to call her MizMo on the Internet and we learned very quickly that she had a great talent for words. 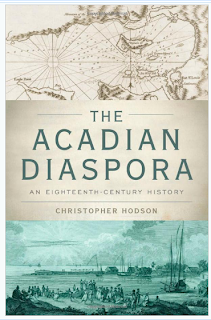 Very soon, she was writing short stories, actually oral histories of her childhood and growing years in Louisiana. 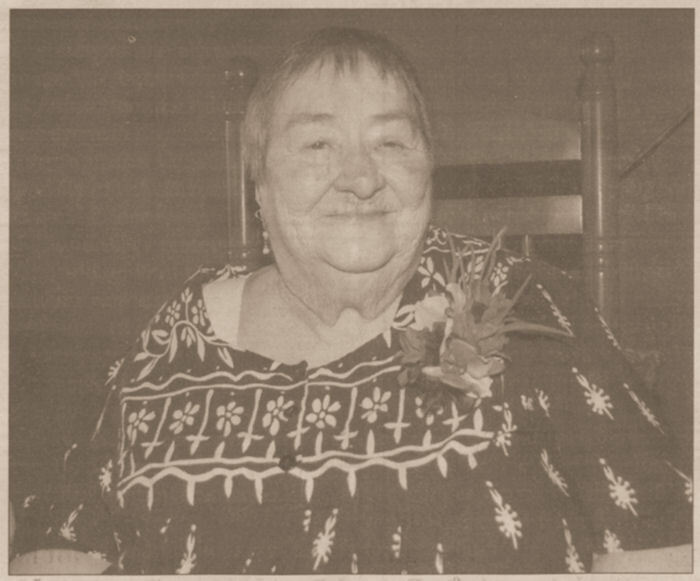 We devoted a section of our family website to her and her short stories. It is titled "On the Bayou"
"My parents were not very demonstrative people. They had not been brought up to be so. I don't remember ever being hugged or kissed by them or my brothers and sisters when I was a child. But I knew they loved me because they protected and took care of me and treated me with dignity, while allowing me to grow and become myself. I had a happy carefree childhood and there were times I felt as though I was in love with the whole world. So many things brought joy to my heart. Lying on my back in soft green grass, looking at the blue sky and finding pictures in the clouds was one of my favorite pastimes. Watching my little brother sit backwards in the old blue rocking chair that he called his horse, and rocking himself to sleep, made me smile. Helping Grandpa in his garden made me feel important, as did picking figs and muscadines and berries in the summer, and pecans and hickory nuts in the Fall. I felt I was contributing to the welfare of the family. And books! I have had a lifelong love affair with books. Because I was blind in one eye, my mother tried to discourage me from reading too much, saying she didn't want me to strain my eye, so I used to hide under her bed where it was cool, and read by the light coming in the window, or sometimes I climbed the hickory tree and hid there to read my brother's Wild West magazines. No one ever knew that I once found a copy of a WhizBang. I started to read it, but what little I understood was so disgusting that I threw it in the bayou and watched it float away. Mom often remarked that I had a mind like a sponge, because I absorbed and remembered everything I read and learned in school. Today, I remember only the things that were important to me, and are important to me now. Why crowd my brain with stuff I don't intend to use? I knew many people, and considered most of them friends, although I cannot honestly say I had a "best friend" until I grew up and married Joseph. He was brought up in the same way I was. Besides being shy and reserved he was not very talkative. He used to say that I talked enough for both of us. I guess it is natural that we raised our children the way we were raised, although I played more with my children. I liked going with them to look for fossils when the Parish truck dumped a fresh load of gravel on our road. I enjoyed taking them to the library. I loved sewing clothes for them. I still remember the pinafore I made for Cissi one Easter. It was dark green with tiny white polka dots, and I crocheted a white lace edging onto the ruffles over the shoulder. I designed the "bubble" playsuit and my girls and some of their cousins were wearing them two years before that little garment hit the market. I will always remember the time our children and I were sitting in the waiting room in the hospital while Joseph was undergoing angioplasty. The nurse came out several times to give us a progress report. The last time she came out, as she was leaving, she turned back and said, "And, Mrs. Meaux, your husband asked me to tell you that he loves you." I turned to the children and said, "Oh, I know he is scared!" My childhood, the Springtime of my life was a happy time for me, and my Summertime has been happy, too. As I face my Autumn, I have finally come to understand how important it is to tell people you love them, and I never miss a chance to do so. I love the way my children, grandchildren and great grandchildren greet me with hugs and kisses when they come to see me. I am a very rich and happy woman, still in love with the whole world. I don't worry about the Winter that is approaching. I know we need this season to sleep and rest and prepare for our next Spring." Just a short note to introduce Cleo and Jennifer Terrio to the rest of the family. They are members of the "Lewis and Emma C. Terriot" Great-Branch from Lebanon, Waupaca, Wisconsin. They live in southern California. 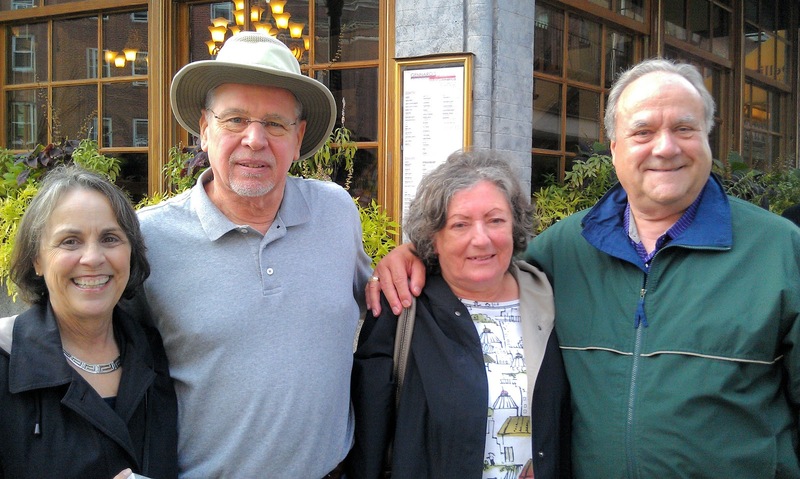 Jennifer contacted us a few days ago to tell us that they were in Nova Scotia, had met Gérard and Gert in Baie Sainte Marie and were pressing on to other destinations. They are in their third month of their road trip and are now making their plans for their westward trek home which will probably take a few more months. They had already planned to spend a few days to tour Boston and the local area and so, we were able to take some time with them for lunch in the North End of Boston at our favoriate Italian restaurant. It was a beautiful day... a little blustery for the ladies but altogether the weather was pretty much perfect. We wish them a 'bon voyage' for their westward ride and we will keep them in our thoughts until they return to the home and five children 3,000 miles away. Jennifer has agreed to join the Terriot Acadian Family as an Associate Delegate. Currently, we have lost contact with Laura Fougere, the current Delegate for the Great-Branch. Hopefully, we will be able to re-establish contact with Laura but if not, Jennifer will step up as the Delegate for the branch. Welcome Cleo and Jennifer! We recently have re-doubled our efforts a few weeks ago to focus on the histories of our Great-Branches. In my opinion, much of the fun of being involved in genealogy is that it allows us to understand the history of our ancestors. Aside from knowing who they were, it's also alot of fun perhaps more, to learn what they did and when. But it's a thousand-fold better for most of us if we can find some photos of our ancestors. That really puts a face on those 15,000 names that we currently have in our JEHAN TERRIOT ARCHIVE. 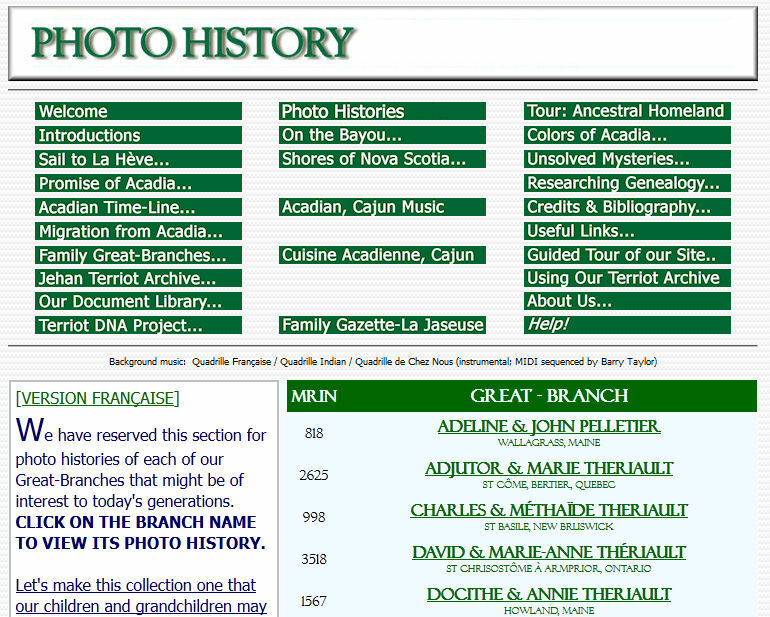 So, we have redesigned our BILINGUAL 'Great-Branch Photo Histories' section of our Terriot website so that each branch has a full page of 'real-estate' to present its story and its photographs. We have complete faith in our delegates and their ability to do a little digging and a little research on their respective branches. Many have been very enterprising in contacting other members of their branch to identify family stories, photographs and other documents that shed some light on the history of their branch. To help the delegates, we have written up a short history of the migration of each branch which is interesting in itself. So, now, we are asking our delegates to 'fill in the blanks' in that history and to at least document what we collectively know about our individual branch histories. I promise you that if and when you succeed in doing so, you will appreciate your Great-Branch so much more but more important, you children, grand-children and great-grand-children will be forever be grateful to you for having taken the time to bring that history to life. In my opinion, those of you who succeed in documenting your branch history to whatever extent that you can, will have succeeded in bringing that history back to life. Because in many cases, if you had not done so, it probably would not have ever been done and would have thus been lost forever. So, by documenting our Great-Branch histories, we are leaving a legacy for your children that they will forever appreciate over the generations. 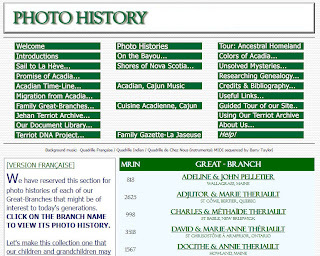 So, take a look at our new 'PHOTO HISTORIES' section, I hope that you will like what you see. We make it very easy to switch from the English side (ENGLISH VERSION) of the website to the French side (VERSION FRANÇAISE) throughout the section. If you are a Great-Branch delegate, let us know if you need help or have any questions. If you are not a delegate, contact your branch delegate and offer your help or better yet, if you have any photo that you think has some historical value, offer to send it to your delegate. From our viewpoint, any material, photo or information about our parents, grandparents, or great-grandparents would be most welcome and would historically be very valuable. Just received a note from Gérard Theriault, our delegate of the "Léo F. & Marguerite R.Theriault" Great-Branch from Petit Ruisseau, NS about an op-ed piece that he read in his local Chronicle Herald. 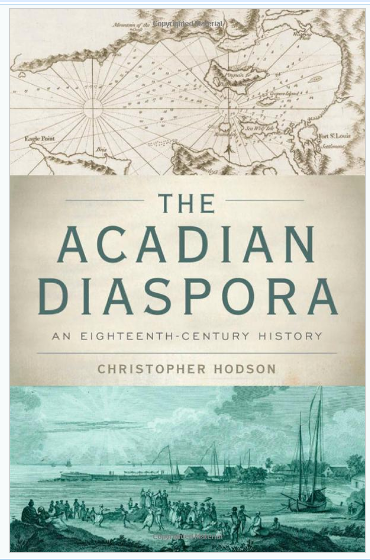 The information was very timely, Gérard, because while I did get a copy of Christopher Dodson's book titled "The Acadian Diaspora: An Eighteenth Century History", it has been on my book shelf in my pile of reading. It's hard to believe but we are approaching our 12th year with our Terriot family website. Over the years, we have gradually worked on improving the 'touch and feel' of the site to try to keep the site interesting, up-to-date and useful. So, we've recently made one or two changes, come by for a visit and let us know what you think.